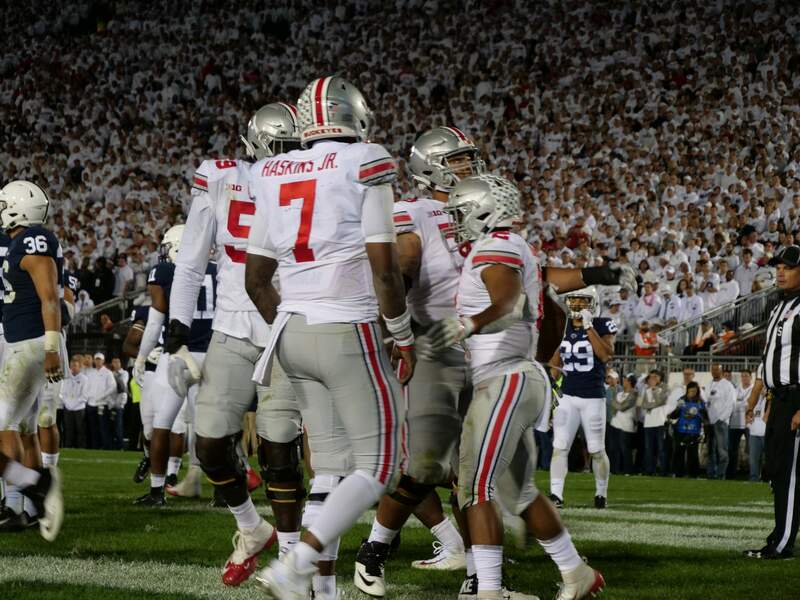 A Top-10 Big Ten heavyweight matchup lived up to its billing Saturday night in Happy Valley as Ohio State outlasted Penn State 27-26 with a furious two-touchdown rally in the fourth quarter. Dwayne Haskins accounted for two of his three touchdown passes in the last seven minutes of the game to help the Buckeyes claim the victory. 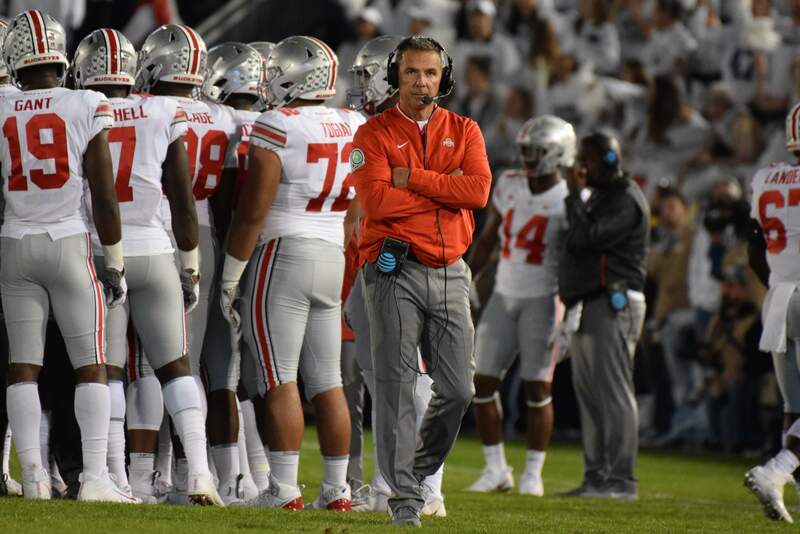 Ohio State, which surrendered points in the first quarter for the first time this season, trailed at the half 13-7 and found itself down 26-14 midway through the final period. The outcome marked the second time in as many years the Buckeyes overcame a double-digit deficit in the fourth quarter to win by a single point. Four of the last five meetings between the programs have been decided by a touchdown or less. Haskins finished 22-39 for 270 yards and three scoring strikes. 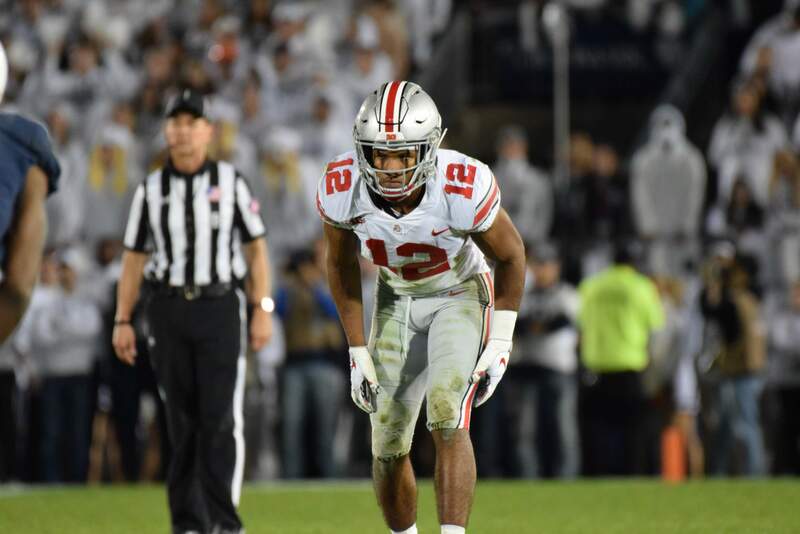 Dobbins scored two times – once on the ground and once via completion – and totaled 118 yards from scrimmage. 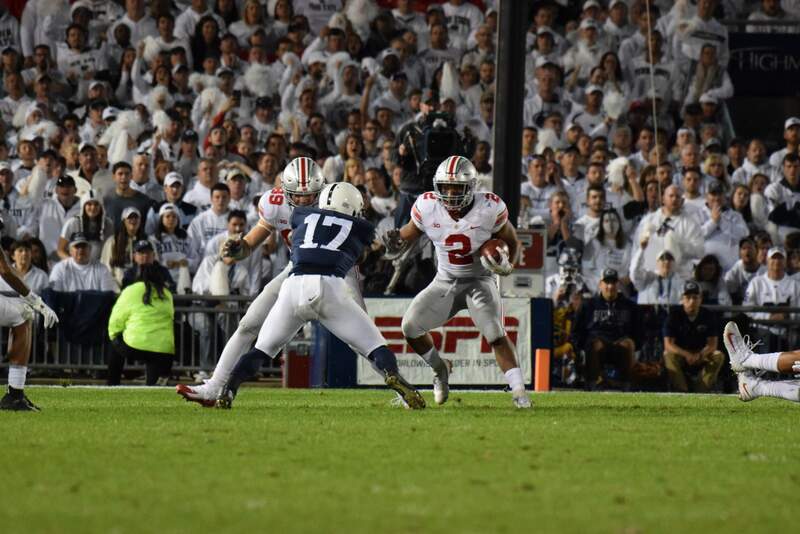 Reminiscent of the finish in 2014, Chase Young stopped Penn State on a fourth and five at midfield with just more than a minute to go to allow the Buckeye offense to seal the game. Ohio State (5-0, 2-0 Big Ten) returns home next Saturday to face Indiana for homecoming in Ohio Stadium. The game kicks off at 4 p.m. on FOX. 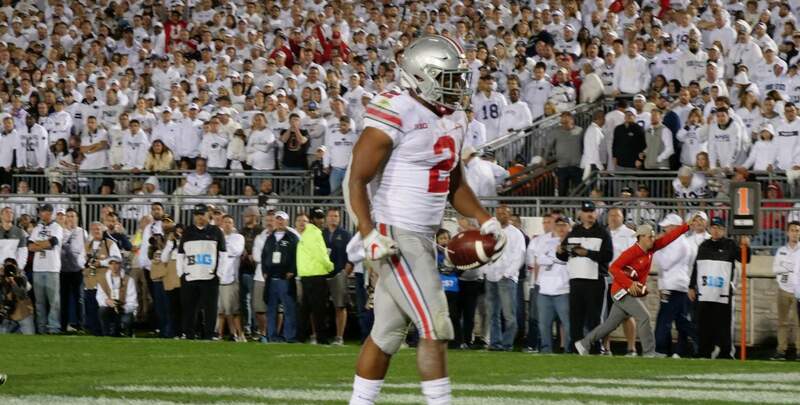 Both Ohio State and Penn State came up empty of their opening possessions. 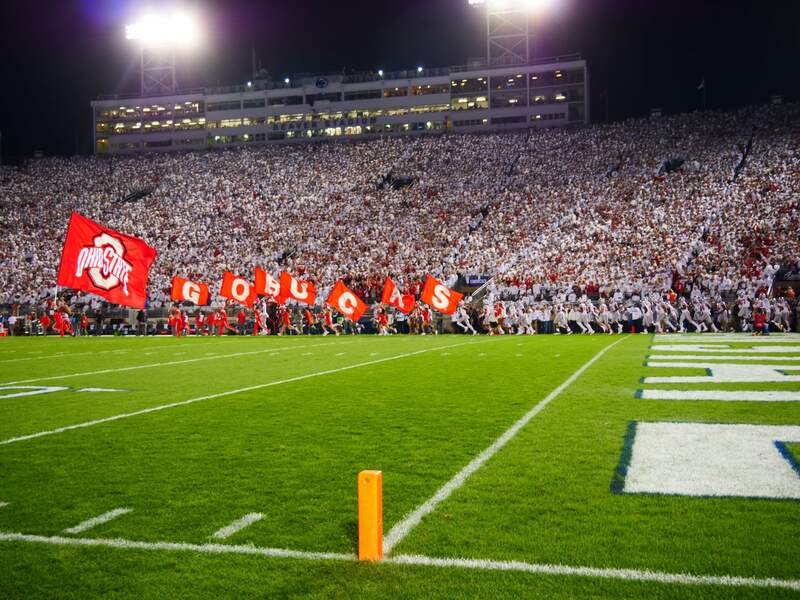 Penn State received the first quarter kickoff and moved the ball down the field, picking up a first down and fourth and two at the Ohio State 40-yard line. The drive, however, stalled and the Nittany Lions were forced to punt. 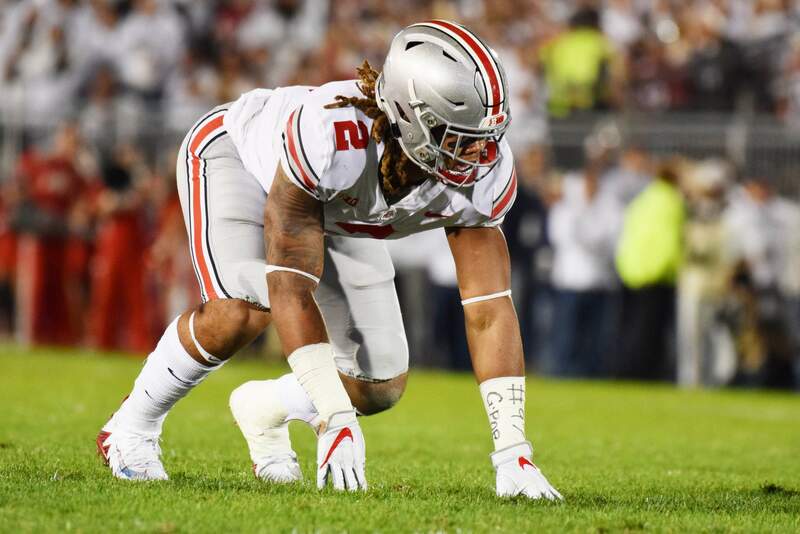 The Buckeyes’ defense has now held their opponents scoreless on each opening drive so far this season. Ohio State picked up a first down on its initial offensive play, but was forced to punt three plays later. Penn State used eight plays to go 64 yards and got a 34-yard field goal by Jake Pinegar to take a 3-0 lead with 4:58 remaining in the opening quarter. The drive was set up by a 31-yard pass from Trace McSorley to Juwan Johnson down the sideline that put PSU into Ohio State territory. The field goal marked the first points scored against the Buckeyes in the first quarter this season. The Buckeyes could not get anything going offensively in the second quarter. The Nittany Lions got a second field goal from Jake Pinegar to go up, 6-0, early in the quarter. Then after punter Drue Chrisman pinned the Nittany Lions on their own 2 after a 58 yard punt, McSorely hit K.J. Hamler for a 93-yard catch and run touchdown to ignite the crowd and give the home team a 13-0 lead. It was the longest pass play against Ohio State in school history and matched the longest play from scrimmage, set most recently two weeks ago vs. TCU. But then Ohio State made a break. Tuf Borland forced a fumble with 2:32 to go in the half that Dre’mont Jones recovered at the Penn State 25. On second and 11, J.K. Dobbins took a short pass from Dwayne Haskins in the right flats and followed blockers into the end zone for a touchdown to cut the lead to 13-7 at the half and send the Scarlet and Gray feeling fortunate heading into intermission. Aside from the score, the first half statistics tell the story of this game so far: Penn State outgaining the Buckeyes, 293 total yards to 93. And thank goodness for Chrisman. His punting – a 47.7-yard average off seven punts with three downed inside the 20 – kept the Nittany Lions from flipping the field and usually deep in its own territory after an exchange. Ohio State received the second half kickoff and methodically moved the ball downfield, culminating in a four-yard run by J.K. Dobbins, which was his second TD of the game. On the drive, Haskins completed five of six passes for 45 yards, including back to back throws late in the drive to K.J. Hill and covered 20 yards. 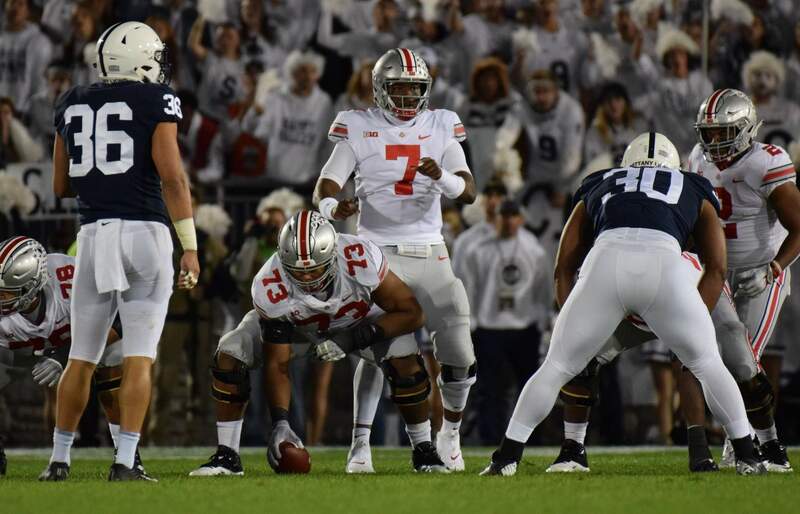 The Buckeyes had an opportunity to increase their lead when they drove deep into Penn State territory of their second possession of the second half, but a facemask penalty nullified a Sean Nuernberger field goal and he missed his next attempt from 48 yards. 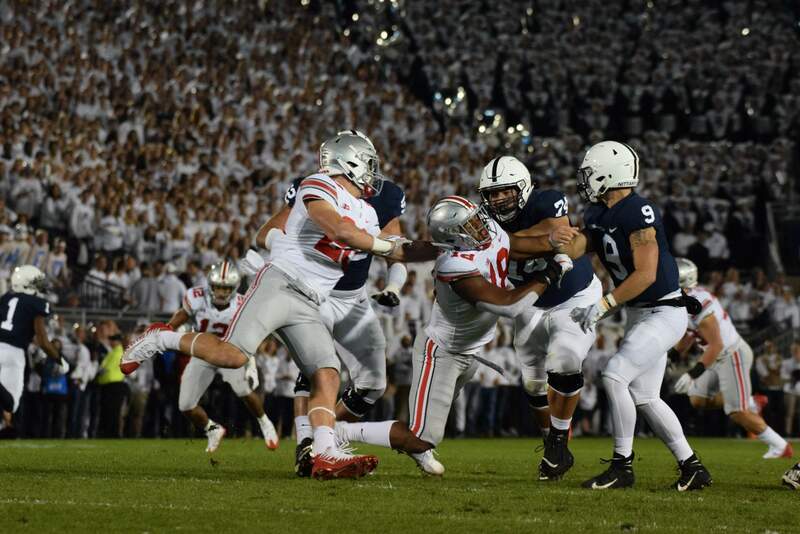 Ohio State forced a three and out of Penn State ensuing possession, highlighted by Malik Harrison chasing down McSorley and limiting him to just a one yard gain on third-and-five. 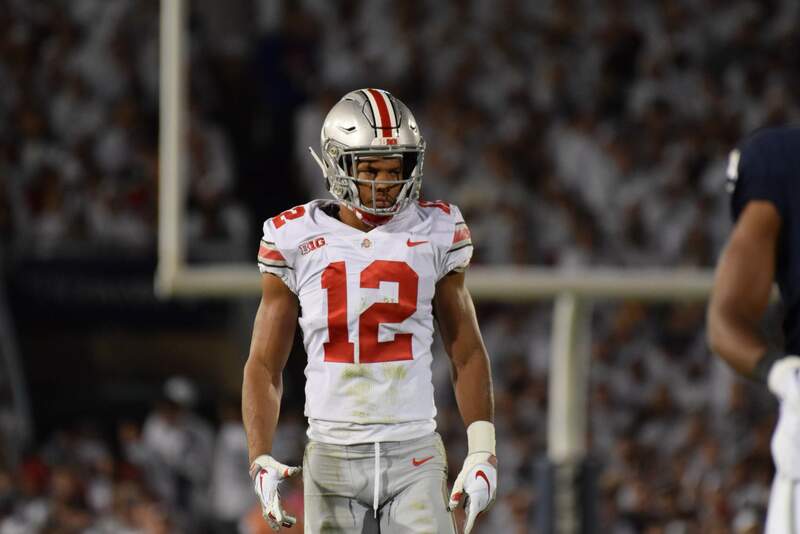 The Buckeyes made another key defensive play with under 1:00 to play in the third, as Chase Young broke up a McSorley pass on fourth-and-one from the PSU 25 yard line to preserve Ohio State’s 14-13 lead. 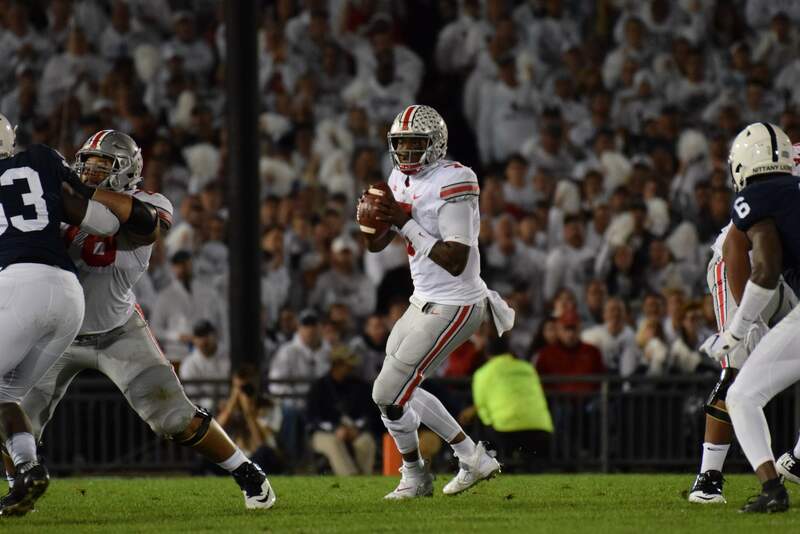 Ohio State opened the final stanza turning over possession to Penn State via punt. The Nittany Lions transitioned the ensuing drive into a 6-play, 73-yard scoring drive, sparked by a 36-yard connection from McSorley to Hamler. The PSU QB capped the rally with a 2-yard TD strike to Pat Freiermuth to give PSU a 20-14 advantage. After gaining a first down on its next possession the Buckeyes turned the ball over on downs as Haskins was stopped on a fourth and one at midfield. Penn State scored a TD on its second straight possession of the quarter after McSorley accounted for two chunk plays – a 21-yard completion and 19-yard run. Miles Sanders punched it in from within the 1-yard line to give Penn State a 26-14 lead after a failed 2-point conversion. 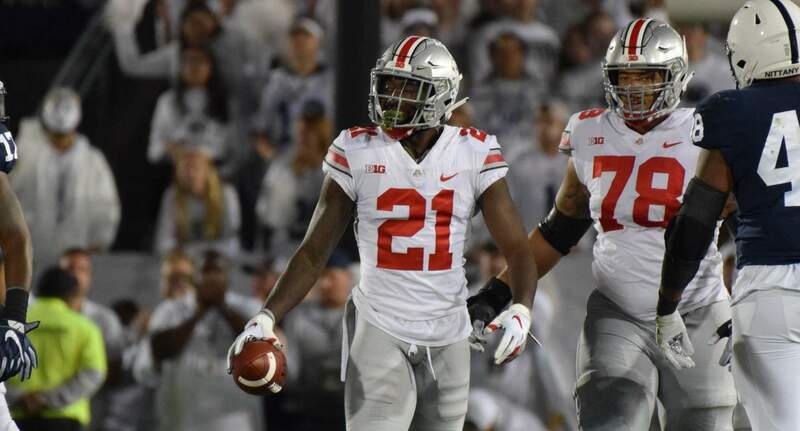 Ohio State struck back quickly, covering 75 yards in just three plays as Haskins found Binjimen Victor for a 47-yard catch and run to the endzone, slicing the PSU lead to just five. The Silver Bullets held strong and forced a punt to regain possession inside its own 5-yard line with less than five minutes to play. The Buckeyes quickly flipped the field with a 35-yard catch and run by Dobbins from Haskins. The OSU signal-caller’s hot hand continued to push the Buckeyes down the field, eventually hitting K.J. Hill in the flat for a sprint down the sideline to the endzone and the game-leading score. The scoring drive covered 96 yards on eight plays in just more than two minutes. Ohio State attempted a two-point conversion and failed to own a one-point lead heading into the waning moments.